With ominous imagery and a typical vacuum Iommi riff we are off to the races!! Hello, everybody, tis’ a new Black Sabbath album with the original lineup except for Bill Ward who is replaced by Brad Wilk of Rage Against the Machine fame. 34 years in the making and here we are, quivering in anticipation. Oye, what is this I see in the opener, modern rock influences in riff salads around 4:00?? While crafted with care and devotion this song “The End of the Beginning” will not be timeless – and that, ladies and gentle men is the story of the day. The next song “God is Dead” makes heavy use of 70’s Sabbath tropes – a very enjoyable track that hearkens back to classics like “Lord of this World” and “Into the Void”. But there is something here that leads me to introspect. Sometimes I fear that the emotional connection that I had with music I heard when I was 16 will never form again with the music I hear now. I do not know if I will ever again relish Sabbath like I did when I first heard “Fairies Wear Boots”. This works against the comeback albums of revered gods. We think that they will capture the spirit of the original zeitgeist, that we will be transported to a musty, ancient world that haunted as, that we will see a figure in black beckoning us to come closer. That this will not happen with 13 is not surprising – and maybe I find Morbid Angel to be more relevant than Sabbath – joyful head banging to “Electric Funeral” has been replaced by mournful introspection to the tune of “The Ancient Ones”. The riffs are awesome and Ozzy is in good form – lucid and clear. However – I feel tired and washed out – for some reason the simple direct riffs, the Iommi hooks and the Butler bass interplay is not very enthusing. Where do we go from here, where music from hither? I like what’s next, a “Planet Caravan” esque ballad. It draws me in and amuses my mind for a few moments. Not bad. However, I have to switch off “13” when it gets over and listen to “Snowblind” and “Wheels of Confusion” to regain my confidence. 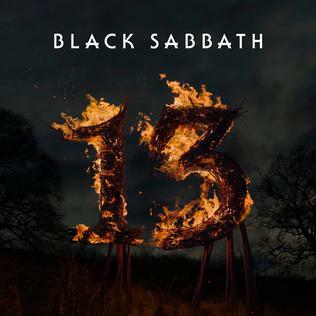 I guess Sabbath’s “13”, while technically perfect and made with the best intentions, fails to truly inspire my imagination. Enjoyable but with a mediocre shelf life, and that’s the bottom line. Recommended Tracks – God is Dead, Zeitgeist, Loner. Tags: 13, Baba T, Bass solo, Black Sabbath, Music, Music Review, Music Reviews. Bookmark the permalink.